Island Pump and Tank will design a remediation system to exceed your expectations. Cleaning up subsurface contamination can be challenging. You can’t see what is under the ground so you need to rely on technology and experience. As a leader in subsurface remediation, we draw upon our over 60 years of experience to apply the right technology for your site-specific needs. While traditional pump and treat and soil vapor extraction methods are still effective in some situations, many sites can be treated more effectively by inducing or accelerating chemical reactions within the contaminated zone. Our In-situ Chemical Oxidant Injections (ChemOx® injections) allow us to clean up subsurface contamination in months instead of years. Our oxygen and ozone injection remediation systems allow us to effectively treat deeper contamination zones and have become the preferred technology for remediating abandoned manufactured gas plant (MGP) sites. 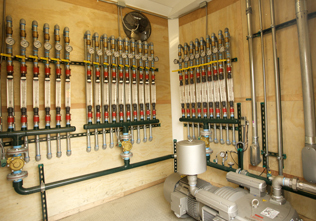 At Island Pump & Tank we have large array of remedial strategies at our disposal, including these following services. • Let our experts evaluate your site and choose the best strategy for your budget, timeline, and subsurface conditions.